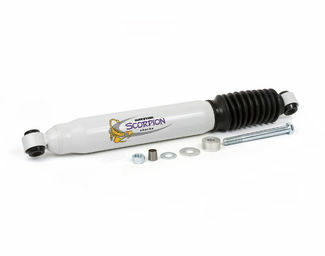 Tuff Country dual SX5000 steering stabilizers are designed for the aggressive off-roader with large oversized tires looking to improve handling characteristics and reduce steering shimmy. Steering stabilizers, also known as steering dampers, are an optional automobile component added to vehicles in order to increase the overall handling performance. 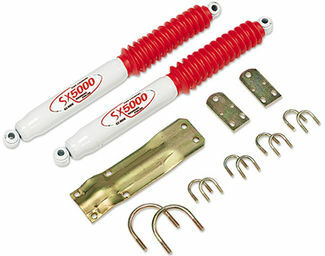 This special kind of shock is connected to the steering linkage at front axle of a truck or suv in order to reduce undesirable driving characteristics, which gives a more sturdy and comfortable ride while improving handling. 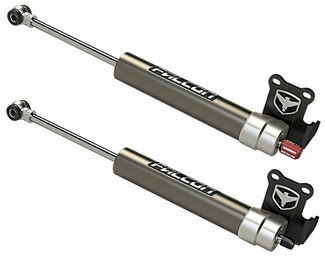 How do steering stabilizers work? When your vehicle hits a pothole, a large rock, or a particularly uneven patch of terrain, you may have noticed that the truck tends to wobble from side to side. Steering stabilizers are mounted horizontally onto the vehicle's steering linkage in order to reduce some of that sudden movement, smoothing out the ride and providing an additional degree of control. In short, whereas a regular shock absorber reduces the vertical movement of your vehicle, a steering stabilizer performs the same function to reduce horizontal movement. Do all vehicles have steering dampers? No, steering stabilizers are not fitted to every consumer truck or suv as standard, however, they are quite commonly fitted to vehicles which are designed to survive more rugged everyday driving, such as SUVs and Jeeps. As an aftermarket part, steering dampers are becoming increasingly popular as a method to improve the overall driving experience. Another big asset of steering stabilizers is their ability to reduce the effect known as 'death wobble'. You may also know of this effect under different names such as steering shimmy, tank-slapper, or speed wobble, but they all refer to the same thing. Steering shimmy is an oscillation between 4-10 Hz which can negatively affect the performance of your vehicle. Often the effect is most noticeable while the vehicle is under acceleration or traveling at high speed. Death wobble is generally due to an imbalance somewhere in the steering system of the vehicle. Loose components, unsymmetrical tire wear, and worn bushings are commonly the culprit. If you've ever pushed a shopping cart with a front wheel that appears to rattle, you've seen death wobble in action. Death wobble is not just a dramatic name. If left untreated, the effect can cause a serious, potentially fatal accident. Steering stabilizers obviously cannot fix the underlying cause of the oscillation, they can help to dramatically reduce the effect. What types of steering stabilizers are available? We offer a wide selection of steering stabilizers from popular brands like Bilstein, Fox, Tuff Country and Falcon. 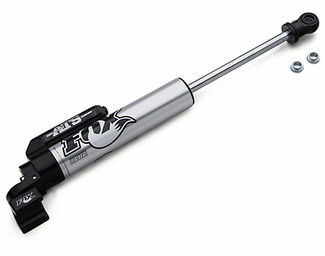 Bilstein steering stabilizers & Fox steering stabilizers are offered mainly for new models trucks and SUVs. While Falcon stabilizers are focused on the Jeep Wrangler market. Tuff Country steering stabilizers cover large share of early model trucks and SUVs.